Multi-purpose to hold surfboards, snowboards, skis and more! 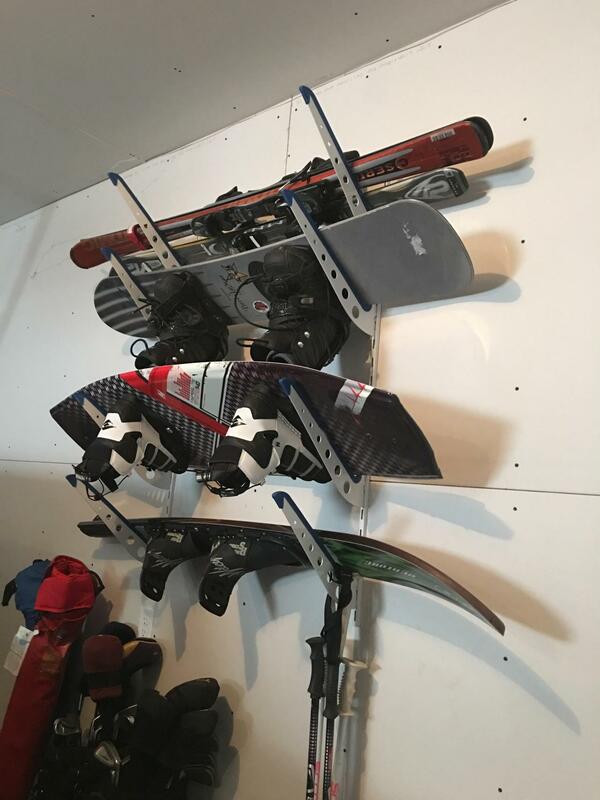 One of the strongest, most versatile wakeboard wall racks around. Simple, customizable, and functional, the rack's arms can be adjusted to accommodate the dimensions of your 4 boards. Of course, it fits all your other boards, too - surfboards, snowboards, skis and more! Traditional wood dowel and pipe foam surf racks are for kooks! This rack blows them out of the water. Adjustable Storage Rack. This rack system consists of 2 vertical tracks and 4 sets of rack arms. Mount the tracks to your wall parallel at whatever distance apart you require to fit the length of your wakeboards. Then, insert the arms into the track's holes at the spacing up and down the track that you need. For even more storage versatility, hang your other wakeboard gear from the cutout holes in the racks' arms. Secure Metal Construction. This Wakeboard Rack is built from steel, which is more than strong enough to support your wakeboards on the wall, and it will last for years. Rubber Padded Arms. The point of a rack is to protect your wakeboards from damage! This rack's arms do just that - their blue rubber coating prevents dings or damage during loading or storage. Mounting and Installation: Included with the rack is everything you need to complete its simple installation. Insert 4 screws through each track into your wall studs, insert your rack arms into the tracks, and you're ready to store your surfboards. To best fit the arms securely into the track, tap the top base of each arm with a hammer. Height of vertical track is 46.5"
If you have a lot of wakeboards and gear that you need to get organized - this is the rack for you. 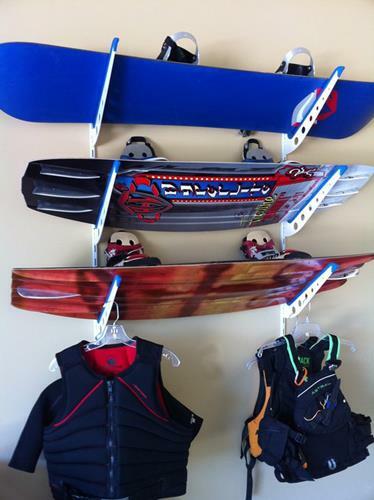 Not only can you store wakeboards but it will also hold wakesurfers, kneeboards, wakeskates, waterskis, and many more. With the open circles in the arms it is also really easy to fit an hanger to hold and dry your life vest, wet suit, and mainlines. The fact that this wakeboard rack has the adjustable arms lets you store all this gear with ease. For example, if you have a wakesurfer you are not going to have bindings so the vertical space you need is less that what you would need for a wakeboard with bindings. I just love that you can store a ton of stuff in a very small space and keep it all organized. If you are a wakeboarding, you pretty much have to have a lot of gear - get this rack to get organized! Did I mention it also looks pretty sweet when it is loaded up with all your boards! Today, I’m going to show you an awesome product that’s going to help you take this massive board, skis, coats, and gear and turn them into this. Let me take a few moments to show you how you can use the XSR to store all of your gear. The first thing I want to show you is how to adjust the arms. I want to put a wakeboard up here. I’m going to need a little bit more room. I’m going to lift the arm out. I’m going to drop it all the way down. You just put a little force on it so it stays in place. Again, pull this one out, drop it down. It allows you to make quick adjustments on the fly. Now, I’ve got plenty of room up above for my bindings. I’m going to drop that in. Now each XSR comes with four pairs of arms, but that doesn’t mean you can only put four boards or skis. Take for instance this wakeboard setup. Pull it out, you can flip it over, drop it in, and then, you could grab another snowboard and just set it right on top of this one. Now you’ve doubled your capacity. One other thing we can do. You can purchase additional storage arms at StoreYourBoard.com, so you can further increase your capacity. You can put up to six pairs of arms on this. If I want to, I can drop another set of arms in here. Now I have room for a long board, skateboard, surfboard anything that’s going to be thin and fit in that spot, I can drop it in there. If you’re storing anything that’s slender in the XSR like for example this set of skis because these arms are designed for wide objects such as wakeboards and surfboards, you can easily put two sets of skis on one set of arms, and that goes for snow skis as well as water skis. One other way to use the XSR is to store your additional gear besides your boards and skis. Take for example you get home from your ride. You got some wet, snowy goggles. You can clip those into the holes. Clip your gloves in. Store those. Maybe you still got a bunch of snow on your coat; you can hang that up in any of these holes. Just keep a hanger handy. Maybe you’ve been at the lake or maybe you’ve been surfing and you have a life vest or a wetsuit that’s still wet. Go ahead and hang them up here. Let them dry out. That way, no one gets mad that you’ve just trashed the carpet. Today, I’m going to show you our latest generation XSR or Xtreme Storage Rack that’s going to provide a great storage location for all the boards and skis and other extreme sports gear that you like to use. Inside the package, what you’re going to find is four pairs of these storage arms. We’ve got a real nice, molded pad on the top so you don’t get any damage to your boards. Also on this, you’re going to notice there’s some holes in here. Now, these will be more than just help this look pretty. It gives you a place to hang gear especially coat hangers and that sort of stuff. You can hang life vests, wetsuits, other things on these brackets. Also inside, you’re going to find the backbone of the system. This is the slotted track. This is what’s going to lie to put these arms in quickly and easily and then adjust them up and down so that you can accommodate a variety of different boards and skis. The other things you’ll find inside the package is your bag of screws, which need to be mounted to your wall studs and also some color instructions that will walk you through getting it up on the wall. Thanks for learning a little bit more about the XSR or Xtreme Storage Rack. Make sure to check out other videos on installation of the board rack and also on how to use the board rack. I am interested in the wake board storage system. I only have 46" of vertical space. What is the material? I'm thinking of cutting 2" off the top (the rough edge would be at the ceiling). Do you think I could do that? The rack is made from a mild steel. You should be able to cut off a couple inches of the vertical uprights with any common metal cutting tool such as a reciprocating saw. Since the vertical uprights have slots all along, you will be able to place the arms along the new 46" verticals and still be able to store your boards. What material are the arms on this rack made of? Are the arms cushioned? The arms of this rack are made out of a heavy gauge steel, that is then coated to help resist corrosion and damage. The top edge of the arms, where the boards sit, are then wrapped with a soft, polymer pad, to protect your boards. How far out from the wall do the arms reach? The arms on this board storage rack are 14.6" long, but because they are at an angle, they only reach out about 10" from the wall. Can this be used for a paddleboard also? Are the arms big enough to hold a knee board? This rack is a great multi-purpose storage rack and will hold all sorts of boards and gear, including kneeboards! If I am going to hang this on plasterboard, what type of screws will I need and what fixings does the rack come with? Our adjustable arm rack should ideally be installed into wall studs. It comes with a quantity of ten (10) 2" screws, though you only need 8 screws to hang the rack. If you were to try to mount it into plasterboard, you would need to use some additional drywall anchors, available from anyplace you purchase hardware (Lowe's, Home Depot, etc.). You would want to make sure the drywall anchors would hold the load intended for this rack (how much you are putting on it). Mounting into wall studs would be preferred and recommended though. Here are some additional installation and mounting tips. Is 6 boards realistic for it? This board has 4 arm levels, so you can store up to 4 wakeboards on it. Is this rack suitable for outdoors? Will it rust? This Wakeboard Storage Rack is not stainless steel so would not be recommended for use outdoors. Great product. Simple to install and simple to use. Written by: Jeff and Cynthia T.
I just installed the storage rack in my garage. It looks terrific. This was much better than I had anticipated. I suggested them to a couple neighbors. Great product! Easy to hang, holds 4 boards easily. Looks sharp in our garage! Extremely easy to mount. Thought the brackes wouldn't wobble as much but ok. If they were double wide would be more stable. But still works great. Easy to adjust. Rubber trim protects your board. 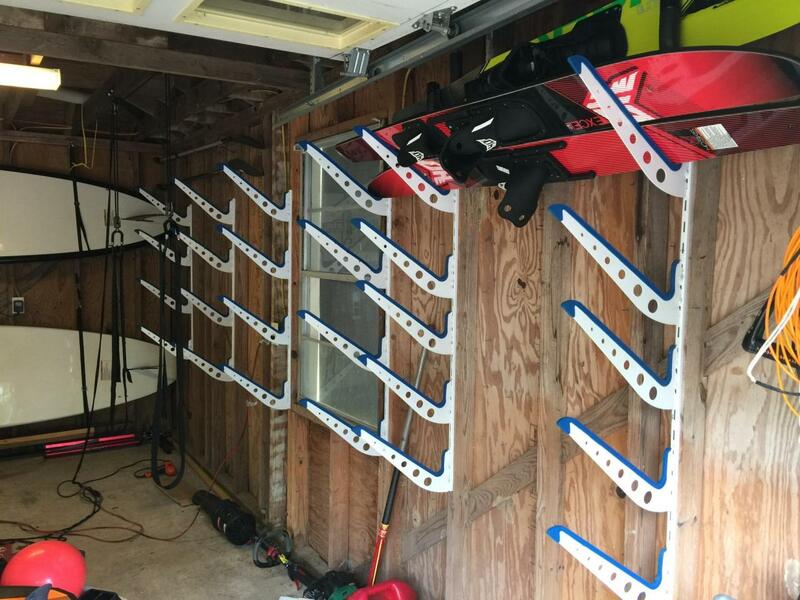 I ordered two Wakeboard Storage Rack systems for my garage to help organize our wakeboard, surf boards, knee boards and various ski's. It was extremely easy to install and the prongs are much longer than I expected allowing me to store more than one set of skii's on a single rack. I liked the storage rack so much I purchased a third set. I bought this to store our 10 foot, stand-up paddle boards during the summer. Pretty simple design and super easy to install. The rack was so handy I bought a second one to install in our basement when we store the boards for the winter. Only "downside" is the blue rubber protectors can come off but they are easy to put back on and I secured them with zip ties which solved the "problem." Plus the price was right...most other racks are over $100. Bought because all our boards were either taking up room on the boat or in the garage floor. Works great storing our wake boards,skis, kneebords and surf boards. Great buy for the money. This was very easy to install and the adjustable racks make this system very flexible. I would highly recommend it! Inexpensive way to keep our wake and wakesurf boards off the floor. However, the arms don’t lock into the posts very well and seem to fall off every time I take a board off the rack. No biggie, but it would be nice if the arms attached more firmly. If you want something that looks good on the wall with all of your boards this is the rack you need. It's easy to install and gives you multiple brackets to adjust to all the different types of boards you may have. I highly recommend this product! The racks were easy to install and hold the boards great. I put the racks in my garage so that when we get home from the lake, we can put our wet boards, ropes, and life jackets on them to dry. This should reduce wear and tear on the gear that we have!! Can’t wait tell next summer to actually use the racks even more!!! These racks are amazing! They are built very sturdy and really hold all of your gear well. My husband is a tough sell but he loves this rack! We plan on ordering more for snow skis, boards etc! 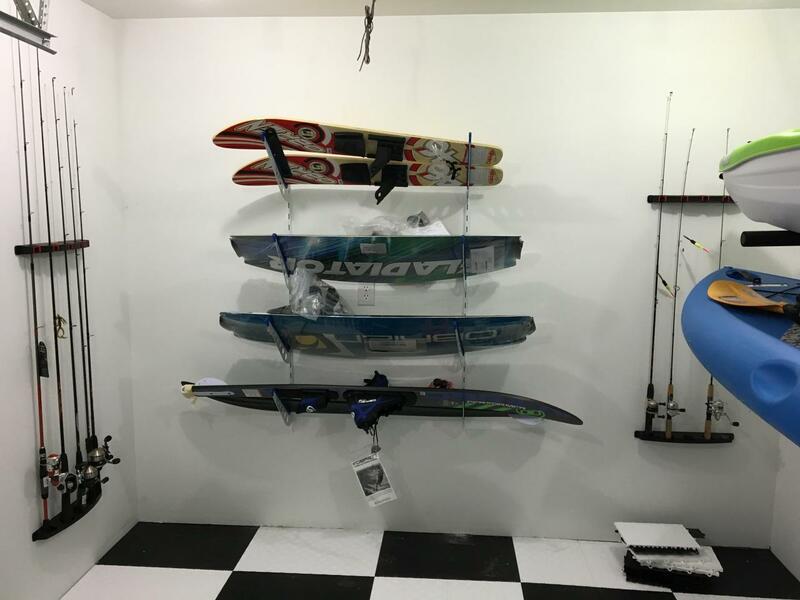 Written by: S r G.
I bought two of the 'board storage units to hang side by side on the same wall so that I could also hang a table-sized umbrella, fishing poles, and boat gear along with wakeboards and skis. This style is simple in concept, but it is one-of-a-kind. Fast service, easy to install, high-quality metal (similar to Rubbermaid's Fast Track). We love our storage racks from store your board. They look great, clean up the garage and keep the boards safe from dings. Great product! I bought an extra bracket as they made it sound like it could accommodate it. It can't, 4 wake boards with bindings is a very tight fit (2 boards are junior) and the 5th bracket I bought was for a wake surf board but there is not enough room for it on the brackets provided. The blue rubber coverings were all pulled off directly out of the box. After re-inserting them, they just don't stay on. Every time you remove a board, the blue rubber padding comes off with it. The racks won't insert into all the gaps that are provided. It just doesn't sit down snug into the gaps, especially where the screws holes are after inserting the provided screws. The brackets are very wobbly after install and is just not the support I was looking for. I would recommend some standard wall mount hooks for a lot cheaper to get the job done. The board holding arms did not just snap into place on the wall mount as shown in the video. No matter what I tried, and I tried a little of everything, the arms would not go in. I finally had to pound each arm into place with a hammer (lots of hammering). So while the product works for now, I will probably not be able to adjust or move it without further damage. A little quality control to make sure all the parts fit together as promised would have really helped! I ordered 2 sets of board racks and they are very easy to install and optimize board storage better than any other solution that i have seen. Our yacht client installed in the onboard garage. Was perfect for their needs. Shipped fast and insatlled easy. The storage rack is simple to hang and simple to use. It relies on a common shelving mount (vertical bars with equally spaced slots) which provides maximum adjustability. The arms have a notch at the lower base which lock the arms into the rack. Because the arms only attach at two points and they extend out, they tend to pivot horizontally. To mitigate this pivot, I hammered the arms down into the rack to ensure the notch was engaged. Even so, the arms still pivot somewhat simply due to torque. This really only matters when you are taking gear on or off from the rack. Given the affordable price and the practical utility, I am generally pleased with this purchase, despite the minor design issue. As for Storeyourboard.com, their customer service is first rate. Awesome rack for your boards! Works perfect. So easy to install. I love that you can hang your life jackets, ropes, and other accessories from the bottom of the arms. I would highly recommend this product! This rack is great very easy to install well made and looks great. I love how well this organizes my boards! 2 concerns only. I ordered 2 extra brackets for my rack, Im sure it would be great storing wake surf boards without a prob, but fitting anything with bindings was a little tight, I had to be creative! It still works though. Second, I wish the screw holes were spaced out a little differently. There were a couple bracket placements I could not use because the bracket would not click in do to hitting the screw. Delivery was fast packaged well and I LOVE the rubber covers on the brackets. I also use hangers and hang life jackets from the bottom holes. Works like a champ. Like the video but even better. Product come in on time, easy to install, leaving plenty of room for the paddle board rack that I am getting ready to purchase! Great product, worth every penny. 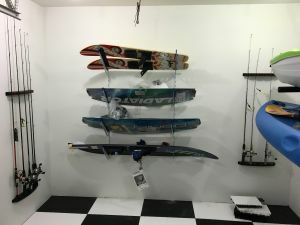 I wish I saw this product years ago, it makes hanging a wakeboard easy and with all the grandkids I have a lot of boards. Thanks again for a great product. The wakeboard storage rack was shipped quickly and the railing inside the box was well sealed and in great condition when it arrived. It only took a few minutes to mount it to my garage wall. I recommend a rubber mallet to ensure the rails are secured to the main connection. Went up easy. The arms don't secure very good in the tracks and move side to side but they do the job. Happy with product so far. Neighbor came by and looked at them and immediately bought some. I should have the whole cove owning them soon! This rack is very easy to install & is great quality for the price. The rubber coating on each of the arms protects the surfaces of your boards. The steep angle of the arms keeps the boards tucked closer to the wall, and also allows you to fit more boards with their bindings in the space. I recommend using a hammer to gently tap the arms down into the notches in the rails so they firmly lock into place. 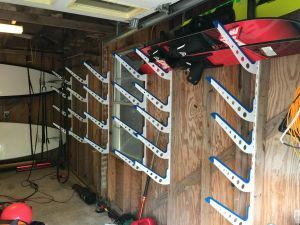 The wakeboard rack arrived right on time and was easy to install. The quality is excellent and I am very pleased with this purchase. An assembly hint; remember to tap the brackets into the slotted channel to provide a firm fit. We installed 2 of these in a customers garage and they totally flipped over them. Great product and easy install. 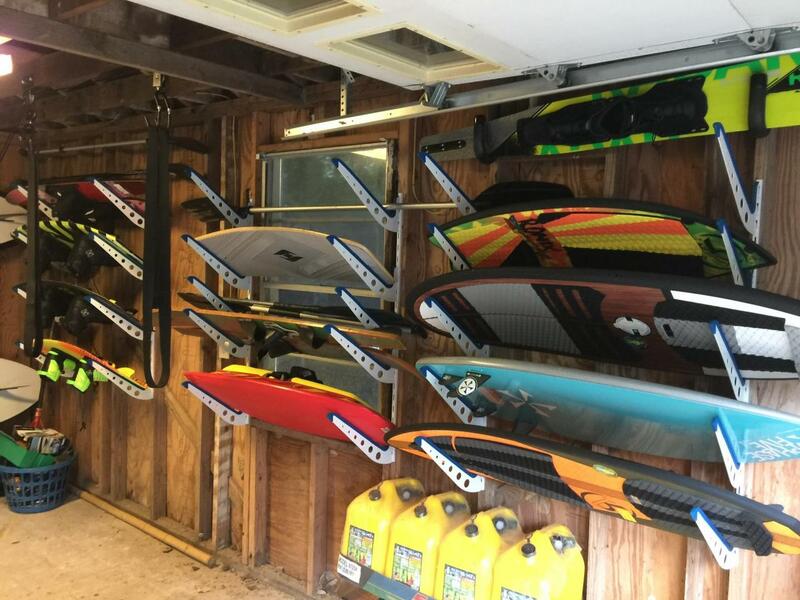 These are awesome for storing our wakeboards and surfboards on our boathouse. Easy to install. Fair price. Good product. Rubber padding less than what I anticipated. Ordered two sets which arrived in same box. Only received enough hardware to mount one set. Bought additional hardware at store to complete install. Easy to install and holds what I need it to. Good product and works as expected. Works great for ski, snowboard, wakeboard and waterski! The product is easy to install and is a great way to store up to 8 boards (one facing up and one facing down per arm). I like the holes as you can put a hanger in their to hang jackets or pants as long as its the bottom arms only. I do wish they would come up with an adjustable bar that would go from one arm to another. This way you could put several hangers for light jackets, life jackets and possibly hang several pairs of gloves and hats. These would all be light items as the arms cannot hold a lot of extra weight. The tips of the arms are good for helmets though, but when you have 4-8 boards you tend to have a lot of accessories. Hopefully they will come up with an ingenious idea for those items soon. Oh, tip I always use my own 3" wood screws. I have found most products have very cheap soft or brittle screws where the heads break off with light torque or the head strips. Great item. Very flexible. Allows us to bring boards up to house during winter, without worrying about them getting damaged from lying around. Nice racks that work great! 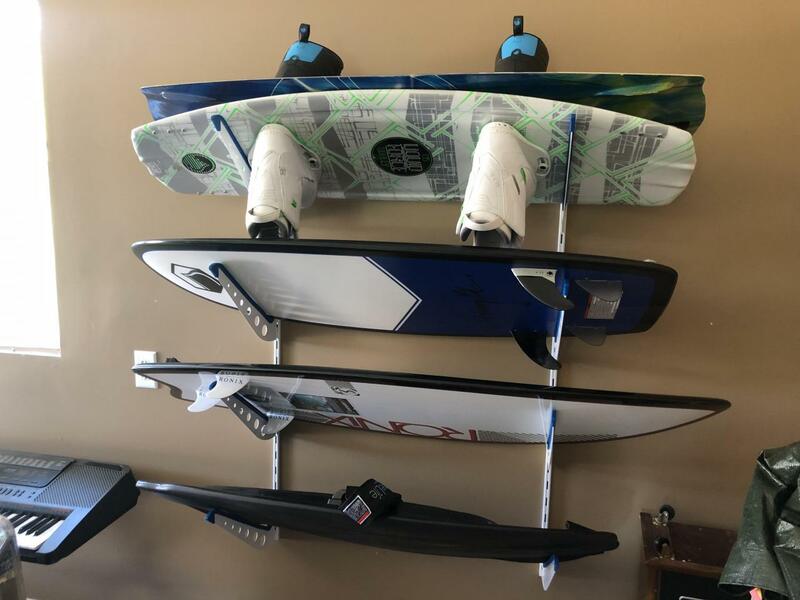 These racks are east to install and their adjustability makes them nice so if ou have boards with or without bindings and even wakesurf boards, you can move around the arms to suit your needs. I've just ordered my 4 set of these racks. I've used 2 sets at home and 2 sets at our winter resort condo. With the rubber coated edge and steel adjustable rack arms, this is the perfect rack for snow boards, wake boards, wake skates, wake surf etc. very happy with the product. Searched all over for a rack system to store wakeboards in the garage. Great price, easy to install, love the padded arms to protect boards. Construction seems sturdy. Holding 4 wakeboards right now and no concern of anything falling/breaking. I bought 3 of these racks to hold my boards! Looked so good I hung them in the family room! I have wakesurfers, snowboards and wakeboards on them! So sweet!!! We bought two of these for our boathouse and absolutely love them. 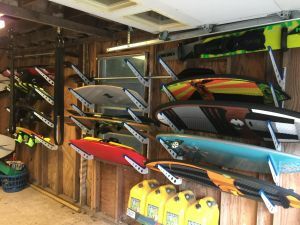 We love the storage for the boards but also love that we can hang wet suits and life jackets on hangers and hang the hangers via the holes on the bottom arm. It was just what we needed to store our wake boards. It was also easy to install. 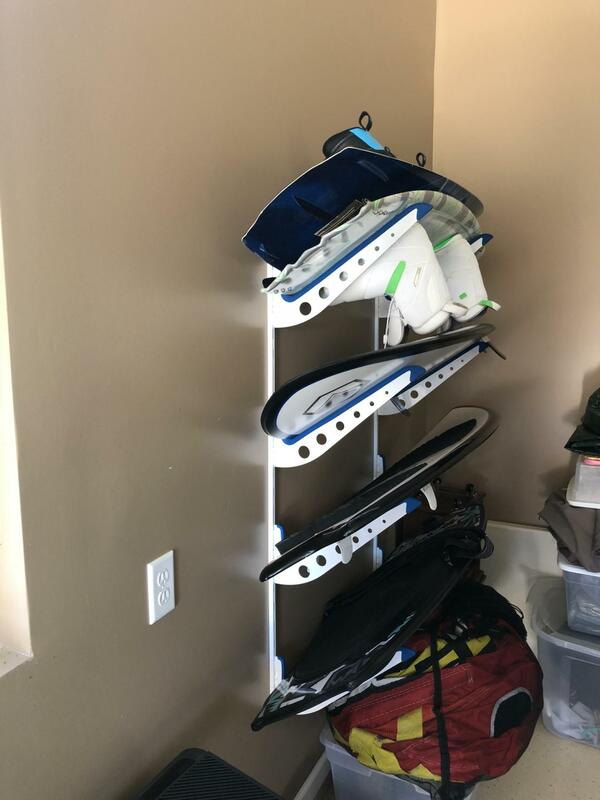 This storage rack is nice if you are storing boards just in your garage or something, however, the blue rubber part that protects the boards easily comes off if not put on slowly and carefully. Another issue I have with this product is how over priced it is. You can find the wall mount in a hardware store for $2 each as well as the rack attachment arms that instead of coming out at an angle, come out straight. If you are looking for a cheap way to mount your boards just go to a hardware store and do it for less than $10. But this product needs to be redesigned and have more to offer if they want this company wants to sell it for so much. Have to work with it. The screws given weren't very strong. I broke one or two and some got dull. So I had to replace all of them. Also When putting the shelf like arms on the bracket... I notice that is was very flimsy and easy to detach from the the bracket. This made me worry about my boards falling down. However, none of my three boards have fallen after a couple of months. The setup was quick and easy, once I replaced the screws. The whole setup looks great and everyone loves it. On the fence if I would have bought it again but satisfied. 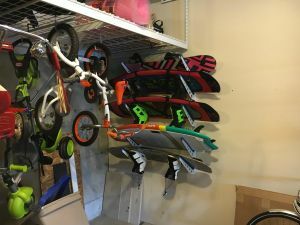 This rack does great holding all your boards and keeps the clutter down in the garage. The adjustable arms makes it nice for different size boards. Good Job! Great product. Installed easily and works very well for wake and surf board storage. We back our boat in and store the boards on the wall from the swim step. It is ridiculous to assume your studs will be placed in the exact location you want your board rack. However, drywall screws (3/16&quot; diameter, 3&quot; long, toggle bolts) work great and are very strong. ALSO, the rack arms are tilted at too strong an angle, and with boards in, you cannot use the arm holes for clipping purposes. LASTLY, the rack arms are not as long, strong, or sturdy as you might think. Overall really like the rack and installation was quick and easy. However, I was really disappointed with the mounting hardware. 3 of the 8 screws needed to mount the rack snapped during installation. Luckily an extra 2 were provided in the bag and I had 1 random screw in the garage that did the trick. Would like to see better quality hardware with the rack. The rack was amazing and I was able to put 5 wakeboards inside our building when we are done for the weekend. 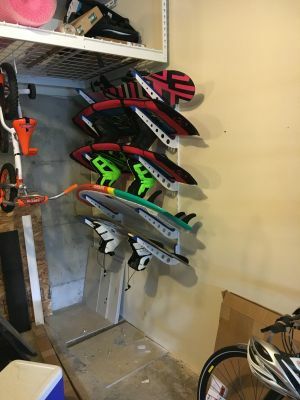 I would recommend this rack to anybody looking to save space and get your wakeboards in a safer place too. We might even add another rack later on. I bought two of these racks to hold our surf boards, long boards and a few other things. The racks and arms are awesome. The screws they sent with the racks are junk though. I broke four screws trying to tighten them. Just pick up a pack of screws from the hardware store and you are set. I got this rack to store my 2 wakeboards and 2 wake surfers in my garage. I usually keep at least one wakeboard and one wakesurfer in the boat but for the winter I take everything out of the boat for storage. Typically this means I stack up my boards against the wall in my garage until spring comes around. Now that I have this wakeboard rack all my boards are up on the wall and I have much more room in my garage!